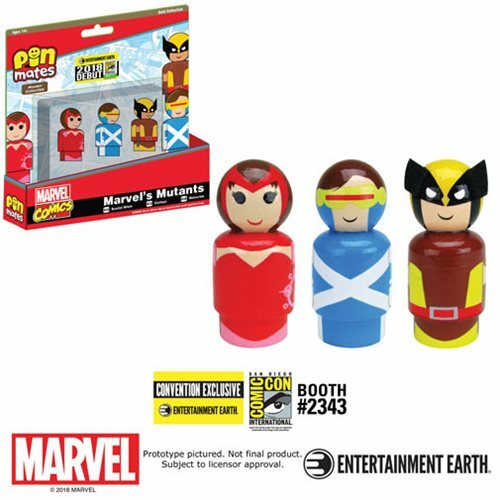 Entertainment Earth has begun to announce their exclusives for San Diego Comic-Con 2018, which includes two fantastic new Marvel Comics Pin Mate Wooden Figure Box Sets! 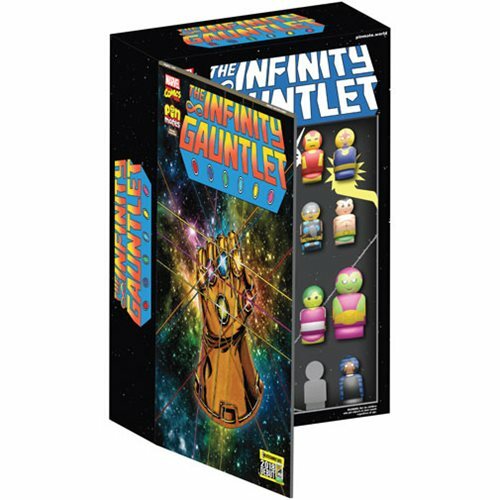 First up is this epic Infinity Gauntlet Pin Mate Set, which is based on the iconic 1991 Marvel Comics mini-series of the same name by Jim Starlin, George Pérez and Ron Lim. This is also the comic book series which Avengers: Infinity War is based on. 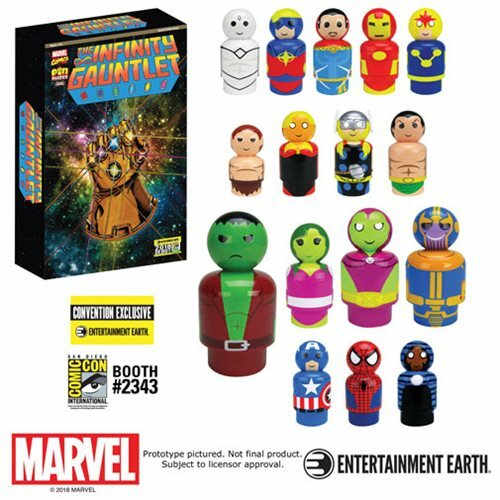 The San Diego Comic-Con 2018 Exclusive Infinity Gauntlet Pin Mate Wooden Figure Collectibles Set features a whopping 16 different characters based on their appearance in the comic book mini series. 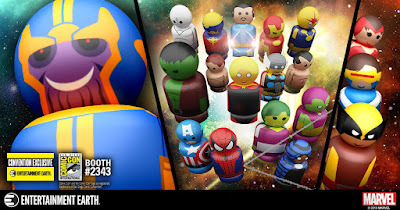 This limited edition set includes heroes Adam Warlock, Pip the Troll, Drax, Quasar, Nova, Spider-Man, Iron Man, Captain America, Thor, Hulk, She-Hulk, Doctor Strange, Vision, Namor the Sub-Mariner, Cloak, and the evil Thanos. The packaging for this SDCC exclusive is also really cool as well! The box’s front, with its large illustration of the Infinity Gauntlet, evokes artwork gracing several of the storyline’s collected editions, while Thanos is packaged on the reverse of the deluxe, fully illustrated window box in his memorable and mocking “Come and get me!” pose from the cover of The Infinity Gauntlet #4. For their part, The Avengers and the other heroes of the Marvel Universe are packed in a recreation of issue #3’s instantly iconic “Call to Arms” cover. This huge box set is limited to 1,500 sets and retails for $109.99. Collectors can pre-ordered it now at Entertainment Earth for delivery after Comic-Con here. What’s really interesting about the Infinity War Pin Mates Box Set is that there are three empty blister spots, which can be filled with the San Diego Comic-Con 2018 Exclusive Gold Series Marvel’s Mutants Pin Mates Wooden Collectibles 3 Pack! This X-Men Pin Mates Wood Figure Box Set includes Wolverine and Cyclops with Avengers member, Scarlet Witch, who are all ready to battle with Thanos. All three of these mutant heroes, who fight for a world that fears them, come wearing their distinctive 1990s costumes. This Marvel Mutant 3 Pack is limited to 1,500 sets and retails for $19.99. Collectors can pre-ordered it now at Entertainment Earth for delivery after Comic-Con here. If you are attending San Diego Comic-Con 2018 next month, you can visit the Entertainment Earth SDCC booth #2343 to purchase both limited edition collectible sets!